The QIP-YPB 2 IPTV Encoder features dual-channel encoders that create MPEG2 or H.264 IPTV streams from two separate video sources. 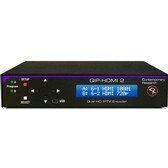 It offers low latency, accepts video resolutions from 480i and 1080p, and supports closed captioning. The output can be changed to resolutions between 480i and 1080p using the built-in scalers. The QIP-YPB 2 IPTV Encoder also accepts audio from embedded SPDIF, or analog stereo and can encode AC3, MPEG 1 Layer 2, or AAC. Embedded captioning from Line 21 data on composite video inputs.